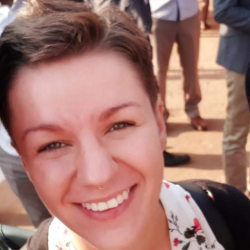 Camilla Schynoll is an economist and worked with ARCOS as a volunteer for a one-year period (from March 2018 to February 2019). At ARCOS Network, Camilla provided support to different activities under the ARCOS Community Development Programme as well as communications department. Apart from that, she has also conducted her own research on behavioural change in the context of community development and environmental resilience. Camilla graduated with distinction from her MSc in Economic Development, specialising in behavioural economics and development economics. Camilla believes that economic development and climate resilience are going hand in hand and are at its best when evidence-based. Camilla has gained numerous intercultural experiences during her various stays abroad and is continuing on that path. She has the intention of staying and working in East Africa. Camilla likes to read, watch movies, draw and meet with friends.